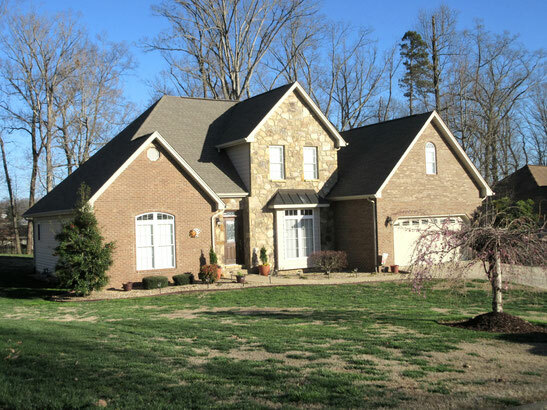 Great curb appeal in this one owner, well maintained, 4 bedroom, 2.5 bath traditional offering a brick and stone front facade, a .59 acre, level lot located in the small 22 lot subdivision of Ashford Forest. Approach the front via the curved concrete walk to the front door accented with a leaded glass insert and leaded glass transom. Once inside you are welcomed with warm oak flooring, a living room with elevated ceiling, fireplace and atrium door to a large, rear deck, formal dining room with tray ceiling and bay window, kitchen with brown cherry cabinets, granite counters, stainless appliances, ceramic tile floor and an airy breakfast room overlooking the backyard and access to the screened porch. The spacious, main level master bedroom has an elevated ceiling and the master bath boasts of a double basin vanity, jetted tub, shower stall and walk-in closet. There is a main level laundry, powder room with pedestal sink and 3 closets for ample storage. Access the upper level via steps with oak treads and ceramic tile accented risers to two more bedrooms, a full bath with 2 separate vanities and a bonus room or 4th bedroom. There is a two car garage with workshop alcove. Must see to appreciate all this house has to offer.